Katharine Rumens trained to teach art, specialising in painting and drawing. She taught English in schools and universities in Europe, returning to UK in the summer vacations to teach arts and crafts to foreign students. In 1980s she retrained in Fashion Production and ran a design studio for most of the decade specialising in women’s occasion wear. She sold through several designer shops where her customers included members of the royal family and women in the media. At theological college she was encouraged to explore art and spirituality and spent half a term painting in the Sinai desert. In her subsequent ordained ministry, she has actively continued this ministry in running workshops and study days and through her work as a chaplain in the arts and the media and also in continuing to make time to paint. 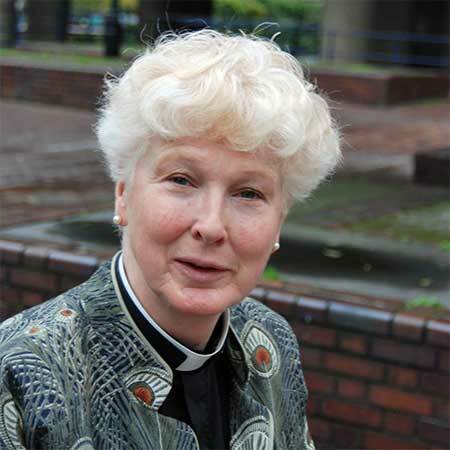 She is Rector of St Giles’ Cripplegate in the Barbican and looks after the Barbican Centre.